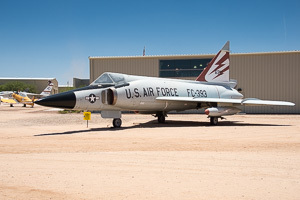 The Convair F-102 Delta Dagger is a single-engine single-seat all-weather interceptor jet fighter aircraft produced by the US-American manufacturer Convair, Consolidated Vultee Aircraft Corporation. The F-102 Delta Dagger was the world's first supersonic all-weather jet interceptor and the first operational delta-wing aircraft operated by the United States Air Force. The TF-102A is a two-seat trainer variant if the F-102 (111 built).